Rare Air Trampoline Park is northern California’s newest hot spot for family fun! Our 10,000 sq. feet of trampoline space includes: multiple dodge ball courts, slam dunk basketball hoops, an air bag pit, our main court, a junior zone and more. Our trampolines are designed with state-of-the-art technology to provide safe family fun for all ages. Whether you’re doing a flip in the main court, performing a trick in the air bag pit, or nailing your brother with a dodge ball, Rare Air combines exercise and fun to support a healthy and active lifestyle. Rare Air’s lounge space is an 8,000 sq ft. area, full of arcade games and party rooms, making us the premier location for your birthday parties, corporate events, and other celebrations. We also offer Air-robics fitness classes, where you will have fun exercising while burning up to 1,000 calories per class, and Toddler Time, where your little ones will have the park to themselves to jump and explore. 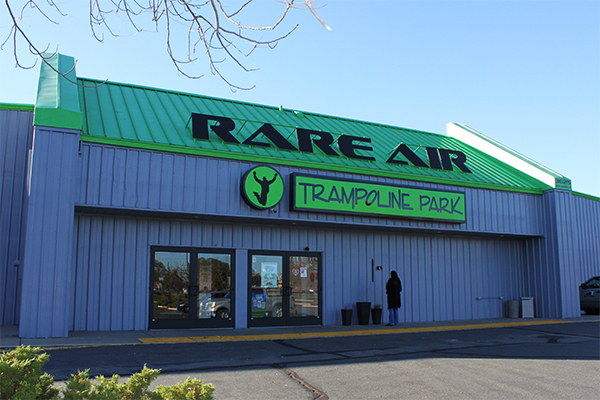 Rare Air Trampoline Park provides a safe and clean environment, with one-of-a-kind jumping fun that all ages can enjoy!